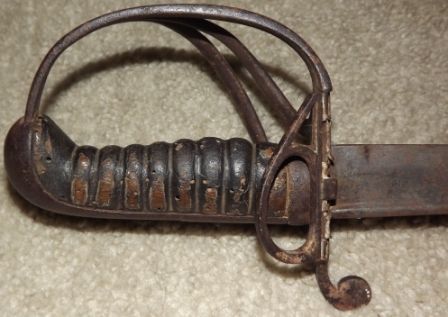 I picked up a British sword today at the flea market and am trying to identify the model but have had no luck surfing the Internet. It has some engraving on the side which is hard to make out but partially reads E. W. Kelsall Kandaha 1880 Surgeon AMD. His medals sold on an auction site and how his sword ended up at a flea market in Northern California I'll never know. One side of the guard folds over. I've tried to add a photographs below. Hi Dennis, your sword looks like (probably is) the British Light Cavalry Officer's sword, pattern 1821. This pattern had a very long life - was not superseded until the 1896 pattern, though troopers, light and heavy cavalry, were issued with a new pattern in 1853. Can't help you with the owner, E.W.Kelsall, I'm afraid. Surgeon Edward W.Kelsall was born in 1851. He was educated for the medical profession, at the Royal College of Surgeons, and the College of Physicians, Dublin, and spent further time studying at the University of Edinburgh. He passed the open competition for Netley, and obtained his commission in 1875. In the Afghan War although he was sent to the front and though not present at Maiwand, he was active in bringing in the wounded on the fatal July 28th. In the ill fated sortie of August 15th, he was with the advanced line of skirmishers, and was one of the first to reach the hostile village, being close beside Major Trench when the latter was shot down. On the arrival of Sir F.Roberts' relieving force from Kabul, Dr Kelsall was detailed to join that General's army, and was present at the battle in which Ayoub Khan was routed. For his services in this campaign, Dr Kelsall was mentioned with commendation in the dispatches home, and received the medal and clasp. In 1882 he served in Egypt and was present both in Kassassin and Tel-el-Kebir. In 1884 he sailed for India, and was stationed at Kirkee (Bombay) until November 1886 when he received orders to join Sir F.Roberts' field force in Burma. He died on the 6th December 1886 as one of the first victims to cholera in the Yemethen district. He received the Royal Humane Society Medal for saving a boy from drowning on the 20th July 1869. Thanks for that info, Dennis. I'm sure that profile of the original owner will add a lot to your appreciation of the sword, even though it's not in perfect condition. All officers had to carry a sword, of course, but why a surgeon had a cavalry sword I don't know. Another challenge for you!